MASTER OF THE WORLD: Epic Fantasy On A Drive-In Budget – Schlockmania! When 20,000 Leagues Under The Sea and Around The World In 80 Days became big, back-to-back hits in the mid-’50s, it kickstarted a vogue for splashy big-screen adaptations of Jules Verne novels that continued well into the ’60s. Many of these films had big budgets and went for an epic tone. American International Pictures was the preeminent producer of drive-in fare during this time and they threw their hat in the ring with a film version of Master Of The World. They weren’t willing to give the film a Hollywood-level budget, instead doing their best to do it on a more modest b-movie budget. Despite some obvious rough edges, it works much better than you might expect – and it also gives Vincent Price one of his most interesting ’60s-era roles, to boot. 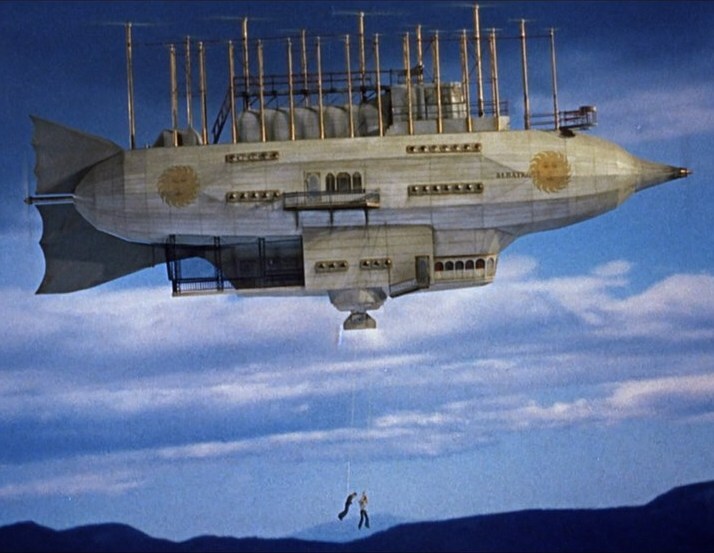 Master Of The World is actually an adaptation of two Verne novels: the titular source and Robur The Conqueror. It begins with mysterious, volcanic activity on a Pennsylvania mountain drawing the attention of the U.S. government in the mid-1800’s. They dispatch agent John Strock (Charles Bronson) to investigate with the help of munitions magnate/hot balloon enthusiast Prudent (Henry Hull), who also brings daughter Dorothy (Mary Webster) and soon-to-be son-in-law Philip (David Frankham). They soon find themselves captives at the mercy of Robur (Price), a brilliant but domineering scientist who has taken them about a giant, sophisticated airship of his own creation. This ship is also heavily armed and they discover that Robur intends to force the world’s nations to disarm or else face his wrath. The result is an epic, albeit a cut-price one. A.I.P.’s notorious tight-fistedness hurts the picture, with the tight budget forcing the use of mediocre and sometimes poor optical effects as well as stock footage. That said, if you can look past these money-induced flaws, Master Of The World remains a pretty rousing fantasy-adventure film. It benefits from a literate script by genre ace Richard Matheson, who offsets the expected thrills with thoughtful characterizations and a challenging, philosophical explanation of topics like pacifism, authoritarianism and following a code vs. being an individual. Master Of The World also makes the most its limited budget with excellent production design by Daniel Haller, a regular of Roger Corman’s Poe adaptation crew: the design of the ship and its interior sets have all the craftsmanship that the visual effects only occasionally achieve. Along similar lines, the score by A.I.P. mainstay Les Baxter is on a par with any epic Hollywood score of the era. The direction by old pro William Witney is sturdy stuff, navigating around the limits of the film’s spectacle with strong performances and a rock-solid sense of pacing. The cast is also quite good for a modestly budgeted film, with Bronson doing nice work in a non-action film as a steely hero whose pragmatism feels modern and a spirited turn from Hull as the wealthy and cantankerous foil to the film’s antihero main character. That said, Master Of The World is built on Price’s performance as Robur and he delivers a charismatic and intense portrayal that fits its requirements beautifully. He is able to project menace and a cultured sensibility all at once and Matheson’s rich characterization for Robur gives him complex levels to play: it’s the kind of characterization who can be scary, sympathetic and witty all in the same scene and Price’s skillful work ensures that he hits all the necessary notes without ever making the performance seem forced or synthetic. 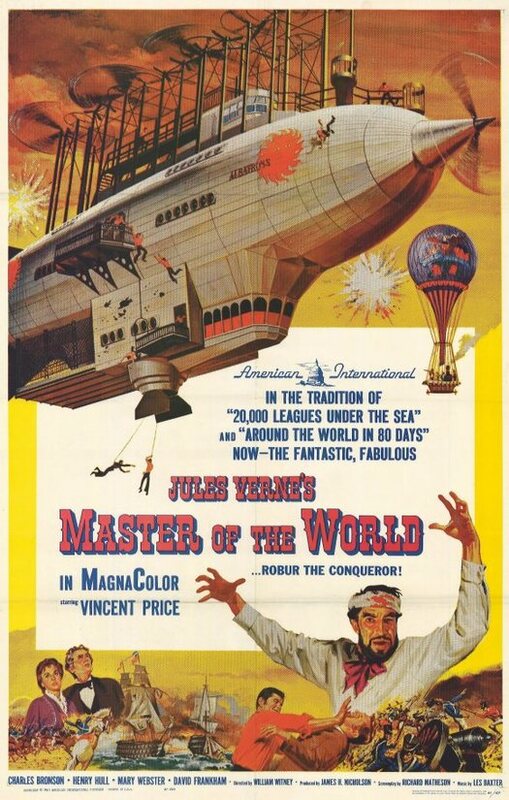 To sum up, Master Of The World might lack the resources that its bigger-budgeted competitors have in the Verne adaptation world but it makes up for that with professionalism, surprising intellectual content and one of Vincent Price’s most vivid performances. If you’re interested in Verne’s work or the great Price roles, it is well worth the time.